Part I of DBOA? Who? peeked at the origins of DBOA, the association's overseas affiliations, its local affiliate members, and some of its officiating engagements. DBOA's Officiating Engagements (Ctd): In addition to refereeing in the national league, DBOA's members also officiated - by invitation - limited numbers of games in several community leagues, e.g. Fond Colé, TRAFON (Trafalgar-Fond Canie), and Roseau Improvement Committee Basketball Leagues. Furthermore, they officiated in the Salisbury, REBOC (Rural Eastern Basketball Organising Committee), Soufriere, Massacre, Portsmouth and Grand Bay Leagues, and possibly others. DBOA referees also officiated the basketball segments of the Windward Islands Schools Games whenever Dominica hosted that tournament during DBOA existence. Additionally, Mikey Casimir, Augustus Harris, Arlington James and Al Monelle, were included in the pools of referees who officiated the Windward Islands, OECS, and OECS "Champion-of-Champions" Basketball Tournaments when such competitions were staged in Dominica. DBOA's Henderson Peter of Portsmouth officiated in the CARICOM Youth Tournament in Jamaica staged in 1997. 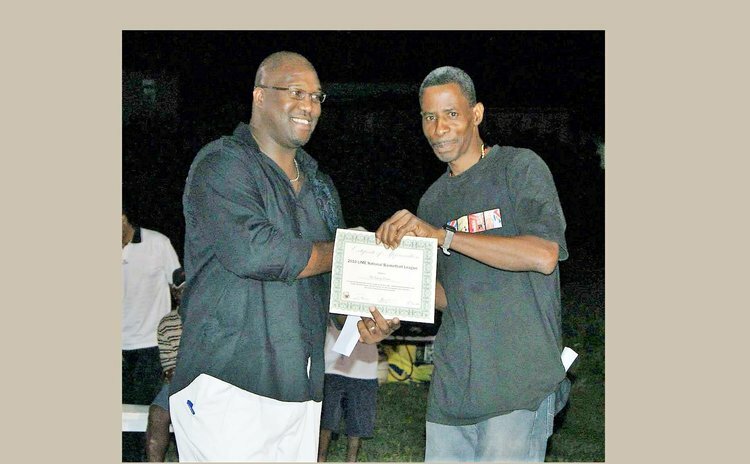 "Hendo" also officiated in the CARICOM Senior Basketball Championships held in Barbados following his stint in Jamaica. His officiating achievements were included in Jump Ball article No. 33 (Part III), "Possie's Basketball Vibes". Other officiating engagements by DBOA Members included a weekend tour by a REBOC team to Marie Galante; the basketball leg of a mini-tournament organized by the Jazz Netball & Basketball Club (1995); a mini-tournament involving an OECS team and one from Barbados; the first-ever DABA Clash-of-Champions (1994); and HOOPFEST '94 in Trafalgar. Further, DBOA referees officiated another weekend tournament, involving a mixed US colleges team and Dominica's National Senior and Under-23 teams (1995); Cardinals' Anniversary Invitational (1997); an invitational weekend tournament involving a French team, two local Division I teams and a Select Under-19 National Team; and an Under-19 Invitational involving representative teams from Guadeloupe and Dominica. Also, in 2004 DBOA referees officiated in a weekend invitational tournament in Martinique that involved teams from Puerto Rico, Martinique, and Dominica's Castle Bruce Oilers and Knicks. It must be noted that in 1991, DBOA received an Award from All Sports Promotion for being the best-organised officials association at the time. Rules Refresher & Officiating Training Sessions: During its lifetime, DBOA held several Rules Refresher sessions for its established members, as well as Rules & Court Mechanics training sessions for incoming individual members. Table officiating sessions were also conducted at the invitation of the Sports Division with students from schools participating in the Schools League. Sessions on FIBA Laws, court mechanics and table officiating were also conducted for personnel from DBOA's Affiliate Members - TRAFON, Castle Bruce and Portsmouth Basketball Committees. In 1994, a senior DBOA referee attended a COPABA-sponsored Officiating Clinic in Trinidad, for officials from the CARICOM Region. Another attended a training programme during the 2000 CARICOM Senior Men's Championships in Barbados. DBOA Easy Social: One activity which DBOA members and special invitees from DABA's Executive looked forward to was DBOA'S Easy Social. On such occasions, referees put aside their whistles and interacted in a social setting. DBOA No More: As an organisation, DBOA folded some years ago. Since then, officiating of basketball games in the National and Schools' Leagues has been performed through an ad hoc sub-committee of the Dominica Amateur Basketball Association. Some of DBOA's referees who survived the long haul, and who continued contributing to the game for several years even after their association had faded away include Allan Morris, Jeff Douglas-Murdock, Leroy "Peggy" Dover, Russell Moreau and Perry Payne. Some were recognised by the DABA for their selfless contributions, while Allan, Jeff, "Peggy" and Russell are still running the court today! Some other "old-school" DBOA officials who made their contributions include Rudy Abraham, Adrian Bannis, Bro. Michael, André Charles, Alphonso Etienne. Additionally, Roland Jean-Jacques, Johnson Jno. Rose, Marcellus Lee, Ywaine Magloire, Milton Paul (deceased), John Roach, Edgar Robinson, Kervin Sorhaindo, Augustus Williams, and others also ran the courts before the advent of 3-man referee teams. Other referees who officiated in national and school leagues games in recent basketball seasons include Garry Benjamin, McDonald Bethel, Donald Burton, Martin Dyer, Rick James, Yehudi John, Javeed Joseph, Harold Julien, Bernard Lee, Jamaal Lloyd, Bernard Mills, Nick Nicholas, Dunstan Peters, Garvin Richards, and several others. And while the perennial problem of inconsistency in commitment from a few officials continues, and which was even lamented over in the local press some years ago, the majority of referees and table officials give selflessly of their time – often for no pay – because of their love for the game of basketball. Basketball Referees are sometimes unnecessarily heckled by fans. However, as was noted earlier, a basketball competition game cannot be played without the "third" team. And referees will continue to make their contributions, DBOA or no DBOA.